Spread batter in pan and bake for about 20 minutes. Lift out of pan and spread glaze over warm brownies. Stir glaze ingredients together in a bowl, adding juice gradually until glaze is spreadable. 325 Comments on "One Bowl Lemon Brownies"
This is the fastest, simplest, most delicious lemon dessert ever…it is my “go to” whenever I need a quick dessert that everyone loves. One bowl, no mixer — what could be easier?! Thank you, Jenny! Jenny, your Flour Basic page says that whole wheat pastry flour is “good for most recipes that use all-purpose flour when you want to add fiber”. Since they have the same protein/gluten %, is there any reason why AP flour wouldn’t be suitable for this recipe? It adds fiber and several minerals. Easy huh? Well, I am the contrary to easy. First I used AP flour, ok everything else ok, but the batter was not sweet at all, I used Stevia,, shouldn’t that have worked/?. i got desperate The brown sugar was next, i Microwaved some brown sugar i n a little plastic measuring cup….which melted in the microwave with the brown sugar, so now I have to throw away the cup and the brown sugar, but I baked the batter anyway. Batter came out good. I am too afraid to try the icing. Are these lemon brownies suppose to be cake like and moist, like super moist? i… need…..help. I can only tell you that if you follow the recipe without any changes, it will turn out. I am not able to figure out problems when the recipe isn’t mine so I urge you to try it exactly as written and then let me know how it turned out. Omg my daughter and i made these brownies. It’s a hit in our household and sooo easy to make. Thank you Jenny you rock!! Hi, oh my gosh these look so good!!! But can you help me with a Substitute of the…Yogurt ? And not sour cream?? I was kinda thinking apple sauce…but it could change the texture.? And taste? …and …we love lemon!!! I really wanted to make Christmas cookies this year but it seem like such a hassle You made it very easy and possible to do and in the process made a wonderful Christmas memory. PS I wife and I love your sense of humor. You should have your own television show with your great talent and personality. You do know that she had her own tv show, right? From 1991 to 2003. Preparing for Christmas and was wondering if these delicious Lemon brownies can be frozen before adding the glaze ?? Yes, you can freeze the cake part. Cake freezes well. I wrap tightly in plastic wrap (sometimes double wrap) and then place in a freezer bag. I made these brownies on a fly. My Dad loves anything lemon. He even wanted the recipe when I told him how easy they were. Blue Ribbon winner, in my house! How do I adjust this recipe for high altitude & a 9″ x 13″ pan? These brownies look so good and after reading the comments I can’t wait to make them. I live in Salt Lake City about 4400 feet above sea level I made no adjustments . they came out wonderful the best ever. I used half wheat and half regular flour was the only difference just because I usually do that with any recipe. I live in Salt Lake City about 4400 feet above sea level I made no adjustments . they came out wonderful the best ever. I used half wheat and half regular flour was the only difference just because I usually do that with any recipe. I would doble the glaze topping next time. The glaze is incredible. Made these tonight. Just delicious. Tried the pastry flour way. Will try the other way next. So fresh, light, just sweet enough, perfect! Thanks for another winner, Chef Jenny!!! i made these Lemon Brownies today, so good! maybe i should stick to a single batch in a smaller pan? For more of a chewy brownie texture, add more eggs. I would try 1 extra for a single batch…if it’s still too cakey, add another one. You more than likely over baked them by just a few minutes. If you want the chewy brownie texture, watch and pull them out when they start pulling away from the edges. If the middle isn’t firm to the touch it’s ok. Most every thing keeps cooking for a couple minutes after they come out of the oven. What a great recipe. I stumbled across your site Friday and made this and the potato salad. So good! When I make the brownies again I will reduce the sugar by about a 1/4 cup. I love a good lemon recipe and this one was so easy to make. Thanks. I will definitely be making more of your recipes. Love your show ! Years ago I remember seeing you on a TV show maybe it was your own . I have moved around so much I can not remember where. Nice to see you around. Nice to see you have “not gone quietly into that dark night” to paraphrase Dylan Thomas. No you are not that old and gosh you look great !!. Please leave the list of drugs you are on with your next recipe. I jest. Here’s an observation: you and many video cooks forget to scrape down the side of the bowel that is nearest to you. I guess it is hard to see. It drives me nuts; think of the waste. Of course if you fail to correct this faux pas it will not affect our relationship. They didn’t have 2% Greek yogurt so i got the 5% is tht o.k. Yes, any kind (except fat free) will work. Of course the extra fat will add a few more calories. I just made this and it took way longer than 20 mins. I kept giving it another 3-4 minutes. Probably a total of 35 mins or so. Anyway, when it was finally cooked and finished, it was DELICIOUS! My trouble is just having a ‘serving size’ (I initially cut it into 16 – hahaha) then decided that it would be better cut into 9 – oh gosh, to try and not eat it! It is quite lovely! Thank you. Gosh, it shouldn’t take that long at all. Make sure your oven is preheated long enough – my oven takes a good 20 minutes to reach 350. I’m glad they turned out. I baked mine 27 minutes. No way were they baked at 20. Delicious! Thanks. I experienced the same thing until I finally figured out I needed to buy an inexpensive oven thermometer to make sure my temps are accurate. What a difference it makes! Only costs about $6 or so. Hope it helps. Different pans can make a difference in what temp you need to bake at also glass +25 degrees or dark pan -25. I am a seasoned cook and love experimenting with very difficult recipes. But when I was asked to be the Cooking Mentor for some young women at my church, I had to get to the basics. Your site is a God-send for the basics as well as keeping it healthy. Just put in the oven your Lemon Brownies. This will definitely be one I’m recommending to my girls. I’ve already highly endorsed your site to them. Thx for making it easy, delicious and healthy. I just made these delicious lemon brownies and I’m in lemon heaven. Jenny, you are the best. I love all your videos. I have made several of your recipes and they turn out just like you said. I absolutely love and adore you. You are without a doubt the best “ teacher” ever. It is because of you I can cook and bake. Thank you for everything you do. Yum yum yummy!! My family are going to love these! Thanks Jenny and have a Happy 4th of July!!! My son loves lemon desserts. He is homeschooled and just finished his Jr. High school year. I am surprising him with this dessert when he comes home from work today. Love simple instructions and ingredients….I had all the ingredients in my house to make this. Hi Jenny. I made your lemon brownies this afternoon but they came out really dense and too moist. I wonder if you have tried making them where you combine the sugar/oil/eggs/lemon juice/lemon rind together, then add all of the dry ingredients separately and then mix the dry into the wet? Would that make a difference if I tried it that way? Have you tried melted butter in place of the oil? If you are reading this, and I hope you are, this is going to seem funny to you. I have been watching your cooking videos for at least 4 or years now and I just realized that you are Jenny Jones of TV fame. Wow, what a small world. I made your one bowl lemon brownies. They were scrumptious. My 86 year old Mom loves lemon desserts. I can’t wait to take them to her. I love this one bowl recipe which is quick and easy to prepare. The lemon brownies are very moist and lemony. My husband and I enjoyed our lemon brownie with a dollop of whipped cream. The whipped cream balances out the sweetness of the glaze. Will definitely make again. sounds wonderful..but there is a difference in the quantity of oil in your video and in the print recipe.. is it 2 or 3 Tablespoons of canola??? OMG !!!! This was an excellent recipe ! Thanks so much Jennie. I love these one bowl baking treats–not so much clean up like other recipes!!! Last night after dinner I craved dessert but I had nothing in the house, not even a piece of candy. I was too lazy to change out of my jammies to venture out to shop so I made your lemon brownies, 30 minutes later I was devouring a warm square lemon brownie, was absolutely perfect with a cup of decaf. Also not much to clean up so a double THANK YOU! I love your recipes!! I’m going to make the lemon brownie today! Looks so yummy! Will be saving and trying this recipe. One thing I do though is change the name. I have a pet-peave about calling any snack bar that is not chocolate a “brownie,” therefore, in my cook book they will be listed a “Lemon Bars,” or Lemonies. I have a recipe for the strawberry version of this that I changed to Pinkies. As much as the hubs and I love lemon, we love lime even more. I am going to do this recipe in the lemon, but I am also going to substitute and do it with the lime. I love lime too. While in Bali I had lime in my ice tea…..never looked back. This recipe is GREAT exactly as written! I don’t need to change a thing!!!!!!!!!!!!!!!!!!!!! Thanks! Delish!!!! I made the cake but topped it with a homemade lemon curd and it was a winner! Hi Me again. Just wanted to put this out there. I did freeze the one bowl lemon brownies and they are just as fresh and delicious as the first day I made them. My granddaughter asked me to make them for a work event. They are awesome. Thank you for your recipes and your humor. I always watched your talk show. Just made the lemon brownies and they are amazing. The lemon juice and zest make them so yummy. Big fan of anything lemon. Do you think they will freeze well, before my husband and I eat the whole plate. Hi Ho Rosalie, did you get an answer to your “can they be frozen and remain as good as freshly made” ? Because in my house, if I did not – these would all wind up as a single size serving!!! These are one of my favorite desserts! I’ve made them twice in 2 weeks and went ahead and bought a whole bag of lemons because I’m sure I’ll make more when they’re gone in 2-3 days. 😊 The first time I made them I used sour cream because I didn’t have yogurt and I used AP flour. They were good but the second batch I made using whole wheat pastry flour and Fage yogurt was much better and less tart than the ones with sour cream. I also added poppyseed to my second batch. Delicious! The fresh lemon zest and juice give superb flavor. Can I double the recipe and bake in a 13×9 pan? After reading your comments on percentage of fat needed for these brownies, I checked my low-fat sour cream, it was 2.5% fat, used that and these brownies were wonderful. Hubs and I are lemon lovers, I had shredded coconut, lightly sprinkled it on top while warm, used nonstick tinfoil, left handles, came out perfectly, parchment did not work for me, nor did reg foil, kept getting holes in them, love all your recipes. Lowfat is not “healthier” when there is still 3/4 cup of sugar in the recipe. There is an increasing amount of research showing that the fat is not the issue causing health problems, it’s the sugar. And unfortunately, there still isn’t a good substitute that isn’t made in the lab and doesn’t cause metabolic syndrome. I’m going to try to make these with seeing how little sugar I can get away with. Most recipes call for MUCH too much sugar. Look into monkfruit. No calories, no carbs, no glycemic spikes for those with diabetes. And no aftertaste like stevia. Pricey, but an organic answer to cane sugar when you really need a little something sweet. I would like to try the ‘lemon brownies’ recipe but I would rather not use yogurt as an ingredient. Is there an ingredient to substitute for it that would work as well? I had some whole milk ricotta that I wanted to use up so I substituted the ricotta for yogurt. I would say it turned out well enough. It was moist but cakey. I had to cook it for 45 to 50 minutes instead of the 20 minutes suggested in recipe. Love the fresh lemon flavor! I will try with yogurt next time though since it may import more of the tangy flavor. I tried the recipe with and again without the yougurt and it worked out very good either way. I also tried adding one tlbs butter another time and it was not to my liking. Another time I used three eggs and did not like it. another time I used three lemons and it was a little tart. Now realizing that Jennies recipe is just right, I will stick to it. I made them today and I used sour cream. They came delicious. Same amount as yogurt. 1/25/18 nice lemon favor. Would use parchment paper to line pan instead of aluminum because some of the cake stuck on to the foil. Will make again. So nice to fiND this easy lemon bars recipe. Just me 2 batches..so glad I did..practice makes perfect! They are just the flavor I am hoping for. Thanks! I can’t believe how easy these were to make! Perfect for a quick dessert that is also impressive (cuz it’s homemade) and delicious! Great recipe! I will be putting this in my “keeper” binder. I have just discovered your blog and videos and I can’t wait to try more recipes. One more question Jenny or anyone else who tried this with Stevia sweetener rather than regular sugar: did you follow the guidelines on the package to substitute with sugar? How did it turn out? I avoid artificial sweeteners but I did try this recipe today and it has a lovely lemon flavour. It felt sinful to add, as a diabetic, 3/4c of sugar. So I modified. Results not as fluffy..but my flour may have been old. I also only had a 12×11.5 pan so I doubled ingredients, but only added 1/2c sugar total. I did not miss the sweet but a less dense result would be nicer; if any one knows a trick for me to fix this.. I will be making this recipe again with fresher flour. Ok with truvia baking mix there’s no reason for ya to not eat your cake. It tastes like sugar and bakes like it too. Thanks for another lovely recipe 🙂 I used sour cream instead of yogurt, and it is great. I love your website! Let it cool more and sprinkle on powdered sugar lightly. Whipped Cream is the better choice here. You might agree when you read the ingredients in Fat Free Cool Whip…. Hi Jenny . I was looking for a great recipe to make for me and my wife’s movie night but I had run out of butter. I came across this recipe and have decided to try it . So far they smell amazing . I’ve got 2 minutes left on the baking . Thanks for the recipe. I’ll comment again after I’ve tried them. She has a one bowl chocolate cake that uses no eggs or milk – just a small amount of butter for the icing. Made last week and it was delish! I love that the recipies I have tried so far were fast, easy cleanup and simple ingredients I always have on hand. We avoid processed foods like the plague and it’s ice to make a treat without lots of cleaning up or two hours in the kitchen. I have made this and many of the great recipes on this site quite often and have lots of success. Today, I didn’t have yogurt and used sour cream instead, and the results were definitely better than when I used yogurt. could the plain 2% yogurt be replaced by milk? No. It would make the batter too runny and also you need the acid element of the yogurt. You could try sour cream. I’m wanting to make your lemon brownies, but I like “stuff” in my brownies – would it be ok to add blueberries to these? If so, how much – and, would it change the baking time? I have no way of knowing since I have only made them plain… sorry. If you try, please let us know how they turned out. Hi Jenny! I love your recipes. Pretty much almost everything I cook now is a Jenny Jones dish. You are my favorite chef! I made these lemon brownies. I used Cake Flour. I didn’t have any lemons so I had to substitute with bottled Lime Juice instead for the recipe + the glaze. I also couldn’t use any zest because I didn’t have any lemons. The lime juice worked just fine! Also, I didn’t have any yogurt so I substituted mayo instead. Everything turned out delicious! Thanks so much for sharing this!!! Hi! You have mentioned a few times to aerate the flour before measuring. Do you mean to sift the flour? Also shall I sift it before or after measuring? Since it will make difference in the total weight of flour, please clarify. What can i use as an egg substitue, and in what quantity? I’ve been making these now since March of this year and they turn out every time, but I’ve completely veganised them. I use plain soya yogurt and an egg replacer called ‘Orgran No Egg Replacer’. I’m in England, but I know for sure that similar things are available in the US. Hope you managed to sort it out, but if not try the above. I’m adding this neat recipe to my file..great video, esp the spot of comedy at the end! Hi Jenny, I love those lemon brownie. I was wondering if we can replace the yogurt with something else? I’m just as home cook sharing what I make at home, but I do provide a metric conversion chart in the blog if that helps. Thank you for this amazing easy recipe, it was a success from first try,love your site and looking forward of trying some of your other recipes!!! Hello: This is the first time that I have sent a comment to anyone on recipes and I just wanted to tell you that the lemon brownies are delicious and so very easy to make. I did melt 3 Tablespoons of butter and they were so good. Maybe next time I will put more zest in the body of the cake, and yes there will be many more times. I also made the cabbage rolls on your sight and they were out of this world. Did everything that you said to do. You have a very enjoyable site, easy to understand and follow and you are great. Thank you for your first recipe comment ever! HI ! Being stuck with a lot of lemons form our own backyard lemon tree, I discovered your recipe, and me and my family, got a bit “lemon brownies” – holic ! I even had my husband’s birthday cake made, using two batches of the lemon brownies batter. After baking the two cakes separately, didn’t cut them at pieces of course, I used bitter chocolate ganache, to join them nd also spread it on the top and sides. I also added about 2 tablespoons of my homemade limoncello into the batter. Thank you for your very simple and very tasty recipes. You don’t know how glorious that sounds to someone living in cold and wet Norfolk in England. What I’d give to be able to grow lemons… so jealous. 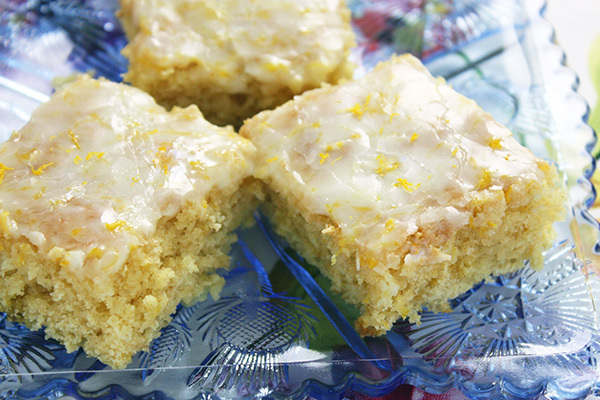 Ah well, I’m off to buy lemons to make these yummy looking squares! Hi Hilly, I live in Red Lion Pennsylvania. You can buy a meyer lemon tree and pot it. I keep mine in the house over winter. I put the tree out in the warm months. It produces enough lemons for my wife and myself. Thank you so much for the Meier lemon bush. Have planned to get one to have in the house in the winter in the Northwest US! Maybe a dwarf!! Hi, Hilly ! In fact , I have three lemon trees in my backyard… I live in Athens, Greece and there is one good thing we have in tons . Sunshine !!! I love your recipes, easy and healthy! I frequently make your easy chocolate cake. However, I’m just wondering why these lemon brownies came out spongey? Not the texture of brownies or cake that I am used to. Kind of rubbery/spongey is how I would best describe it. I can get past it in the easy chocolate cake because I add semisweet chocolate chips and when they melt it all just kind of makes it fudgey and delicious. But I have to admit the sponginess of this made me wonder what I would change if I was going to try them again. Thoughts? Maybe this is how it’s supposed to be since it’s a healthy recipe? Oh and I used all-purpose flour. Did you aerate your flour? What kind of yogurt and oil did you use? Fresh lemon? With a little more info, I can try to help. One of the easiest and tastiest recipes I have ever made. Definitely going on my Pinterest page. I think I would call them lemon blondies, not brownies, but maybe that’s just me. By the way, I used coconut oil (melted and cooled) instead of olive or canola oil. Worked great. Baking time was off and my oven is accurate. Has anyone else had that problem? In any case it’s not a big deal. I wonder if the baking time changes when using coconut oil. Was it more or less time needed? Required more time, about 35 mintutes and 40 would have been better. Never thought about the coconut oil needing more time. I use it a lot, more in cooking than baking, but I’ve never noticed it requiring more time. I use it because it’s supposed to be a healthy fat and the flavor is good. Next time I’ll make two batches, one with canola, the other with coconut and see what happens. I do some catering so I’ll wait for an event. It was more time. I’m about to make them again for an event that I’m catering tomorrow and doing exactly what I did before. I just need to go pick the lemons. My citrus trees are in full bloom and my garden smells heavenly. Yes. I made this recipe today for the first time. I used sunflower oil in my mixture and my oven is also accurate. But mine were very liquidy after the 20 minute bake time. I added another 11 minutes and they came out perfect! I can honestly say I’ve never made anything so easy from the first time, and so tasty. Baking doesn’t come easy for me but now I feel like I can bake. And I love the natural lemon taste. Just took them out of the oven, they look beautiful. I just sprayed generously with Pam and they came out like a dream. Thank you for the recipe! I’m not sure I’d call these a brownie as even my cake-like brownies are denser than this. However, still very good…or as my husband says, “excruciatingly lemony”. Will definitely make again. i made it last night….. its perfect! i just want to know can i make it with orange? I think it will be too sweet with orange and if you reduce the sugar, you may have to make other adjustments. It’s best to look for a different recipe that is already proven with orange. MOST AMAZING DESERT EVER!!!! 😁🙌😊 I made 3 lemon brownies, at my brother’s house over the summer, and then I tried one with orange zest and juice, instead of lemon zest and juice. He wanted me to try it with lime zest and juice next time. I am about to make lemon brownies, but I want to bake the batter in muffin tins, using small squares of tin foil, so they don’t stick. Do you think that would work? Can you make the lemon brownies with either orange or lime zest and juice? I watched your you tube videos, and I am hoping to try to make your sticky buns and your easy one bowl chocolate cake. I didn’t have to use tin foil, just oil and some flour, and the popped right out! They were amazing, I gave them to my friends at school, and they loved them! Believe it or not I had a crush on you that’s why I used to watch that show I didn’t understand or know what was going on but I did know that I had a crush on you. Wow, I’m in love with your video! So clear, well designed, sharp, and yet cute! Am definitely bake this lemon brownie this weekend!! Hi jenny , I live in Winnipeg and I found the whole wheat pastry flour at the bulk barn here. I made your whole wheat bread today it turned out so good I’m glad I found your recipes do you have a cook book out. Can I poke holes in the brownies while they’re warm and pour the glaze so that the brownies soak them up? Will this be too sweet or lemony? I don’t think the glaze will soak in because it’s too thick, even if you poke holes. But you could eliminate the glaze and pour over a syrup and that will definitely soak in. I do my Greek walnut cake that way. You could make a syrup by boiling some water, sugar, and a piece of lemon peel or create your own. hey jenny, could I use whole wheat flour instead of pastry flour I’ve been all over looking for it and can’t seem to find it.or would it ruin the recipe. Regular whole wheat flour does not bake like whole wheat pastry flour so I would suggest using all purpose flour. If you’re near a Whole Foods they sell whole wheat pastry flour and also you can get it online from Bob’s Red Mill and it can be kept frozen. If you bake much at all, it’s probably worth buying online. Some Canadians can’t seem to find whole wheat pastry flour there. Can you please say where you found it? Jenny, In Canada, whole wheat pastry flour can be purchased from Whole Foods and Save-on Foods, for 2 places. I don’t know – I don’t count calories and I’m just sharing my own recipes I make at home. I want to make the brownies but do not have plain yogurt. (Only vanilla) what is the alternative to yogurt? You can use sour cream or wait until you get some plain Greek yogurt, which is the best choice. I used fat free sour cream because we had no yogurt at home and it turned out great. Thanks for the recipe and will explore for more. After reading your bio, we remember your show from then, glad to see you’re in good health. Honestly, I didn’t think they would be so good as there was no butter added; surprisingly they were DELISH… needless to say I will be making these again. You’re recipes are so good! My husband loved the cinnamon rolls so im making all your other recipes! 1) The size of my baking pan is 9×13, i don’t have the 8×8. What do you recommend i do? 2) If i want to make more servings, could i just double the volume of the ingredients and use the 9x 13? What makes this recipe so good and so popular is the use of fresh lemons where you use the peel and the freshly squeezed juice. I do not recommend bottled juice, sweetened or not, in this recipe. I’m just a home cook posting the recipes I make at home – it’s just a hobby for me. I tried to make this today and it turns out very awesome. Thanks for the recipe jenny. Very easy and quick. I love your simple, straightforward recipes. Make more lemon ANYTHING! I don’t know is this is covered in the comments, but there are so many, and in the quick look I had, I couldn’t see anything. Can I use low fat French vanilla yogurt? Not a good idea because it’s sweetened. Use plain yogurt. Can I use spelt flour instead of weat flour?? I have no experience with spelt flour but you would have better luck looking a recipe that specifically uses spelt. Making changes in baking can often lead to failure and I only know that my recipe will work as written. I wanted to make a cake on Sunday but had NO butter…..so a quick google showed this recipe….then I realised I had no yoghurt either…..so I substituted it for sour cream and a bit of coconut cream (the solid stuff) and the cake was magnificent!!!! I suspect it would have been just as good with the yogurt…however…it did not last long in my house LOL. It had more of a pound cake finish for me but super moist and and the glaze topped it off beautifully….Im going to make passionfruit curd to go with it next. LOVE THIS!!!! Hi Jenny, have you ever made these using AP flour? I don’t usually keep pastry flour around but want to make these!!! Thanks so much for all of your wonderful recipes. I can’t get enough of your skillet pizza. My whole family is using that recipe now!!! Please look at my recipe again. It uses either flour. Oh my goodness, Jenny. I am so sorry I bothered you when it was in the recipe the whole time! Seems like I’m always in a hurry and I need to take the time to read carefully. Thanks so much. Jenny thank you bunches for a great recipe ! I used lime only because it was Sunday no stores open here on the prairie in northern ND . I made a coconut glaze , smoothed it over the top then put it under my broiler to toast the coconut . It was Crazy Good , Oh My God ! Eating this with 1 scoop of June berry ice cream so yummy , thank you again ! Yum yum and yum. Second time making these and they are quick and delish. Thanks for the recipe. This recipe is absolutely delicious! Recommended and sent to me by my son. Cut the sugar just a bit in the recipe and made a 1/4 cup powdered sugar glaze which was perfect for me. Also used 1/2 tsp pure lemon extract instead of the lemon rind. Thanks Jenny! Going to be a favorite! I just made this brownies but the texture is very dense. Could it be due to the flour? I followed exactly 1 cup. Perhaps you can convert into gramage for me? Secondly of suspect it may be the oil. I don’t have extra light olive oil and used extra virgin olive oil instead. Do you think this could be the culprit? It’s not the oil but more likely the way you measured the flour (it must be aerated first), or the type of flour. For measuring, please see my blog posting on Flour Basics: https://www.jennycancook.com/category/helpful-hints/. If you did not use either all purpose flour or whole wheat PASTRY flour, that could also be the cause. If I double the recipe and bake in a 9×13 pan how long should I bake it? The dough will be a little thicker in a 9 x 13 so it should take a little longer to bake. I would check it at 20 but expect it will take at least 25 minutes, possibly a bit more. Just keep checking it with a toothpick. just made these and they are cooling now. how can i store these best? I store all my baked stuff in the refrigerator after the first day. With lemon brownies, I cut them into squares and keep them in a tightly sealed container, refrigerated. A couple of things may have caused it: 1) Did you use whole wheat flour and not whole wheat “pastry” flour? 2) Did you use any other sweetener besides white sugar? 3) Was you baking soda fresh? 4) Did you replace the yogurt with something else? This is a dependable recipe so there has to be an explanation. Almost everyone who follows the recipe exactly gets a great result. Let me know of anything different and I can help figure it out. It’s important that my recipes work for everyone. I noticed you said baking “powder”and not baking “soda” so that would be the main problem. This recipe needs baking soda which works with acidic ingredients to make baked goods rise. The only other things that could have made a difference is the fat free yogurt (mine is 2% which provides a little fat) and if you did not aerate the flour before measuring because that would have resulted in too much flour. But unless you made a typo, it’s definitely the baking powder that’s the problem. Please keep me posted. So far, I’ve tried the two types of brownies, crepes, Polish pierogi, baked ziti ( I used mock, Italian ground), and potato pancakes. Healthy, delicious and easy to follow instructions and fun to watch videos. With your help, I’m even turning into a pretty good baker, too! Next, is the orange-sesame chicken. For us, it will be mock chicken; I’m sure equally delicious. Can’t wait to bake the crispy, sour dough buns, though. What can I say? Dziekuje slicznie. this sounds so good! Planning to make these tomorrow. What do you think about substituting coconut oil for the vegetable oil? Another person commented about making them with coconut yogurt. The combination of coconut and lemon sounds delicious! Yes, you can use melted and cooled coconut oil and I agree that lemon and coconut are great together. I thought about tossing some coconut on top of the glaze while it’s still warm. At wat temperature should we keep, if making in a Microwave? I have never baked anything in a microwave so I’m not able to tell you. I suggest you look at other recipes for microwave brownies to determine the time and temperature and then you can use my recipe with their microwave notes. I download your cookbook, ya so happy and I subscribed! Why don”t make a video of the lemon bars? Cos I like to see u on screen.. Can u make low fat birthday cake? Hope to see your next healthy recipe. I love your site! Your recipes look delicious and seem easy to do. I made the lemon brownies and they turned out fabulous – I almost ate the whole cake myself! I have a diabetic husband – can I use a natural sugar substitute (stevia) to equal the sugar? Will that affect the taste or texture? Thank you! I look forward to trying all of your recipes. I am not an astute baker, but the brownies turned out so well and boosted my confidence. I have no experience baking with stevia but I don’t think it has the texture of granulated sugar so you may not be happy with the result. It might be better to look for a diabetic recipe that’s already proven to work without sugar. There’s a lot of information online about baking with stevia. Hi Jenny, thank you fr the recipe. Tried & turn out the same texture & looks exactly like yr video. Unfortunately the brownie had a too strong yogurt smell tht puts off the appetite. Why is that? I guess so too…thanks alot jenny…however the brownie tasted superb & so soft. 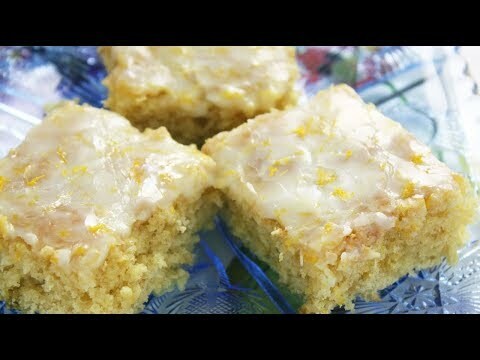 Do you hv moist orange cake recipe? Also can i use fresh milk instead of the yogurt? I do not have an orange cake and in this recipe, you can not replace the yogurt with milk. It’s the acid in yogurt that produces the soft texture in these brownies. Sour Cream can be substituted for Yogurt ….for those that don’t care for yogurt, sour cream is not quite so tangy. This is wonderful favor ! Especially about Grazing. It is first trying Lemon Graze. Usually in Vanilla Essence or Milk or something ordinary liquid I using. No, neither baking powder or baking soda can be substituted for eggs. I made them without eggs… i forgot to put them in if Im honest just not so yellow or wet. Jenny. Was intrigued by the name and recipe. Thought I would give it a go! Wow! So good, very easy to make, and deeeelish! I ate three! I’m going to make them again and will double the recipe! Thanks for such a great spring time dessert! Jenny! I made these ‘lemonies’ (as we are now calling them) gluten free and dairy free… substitued my ‘Better Batter’ flour (combo of GF flours) and used Tofutti sour cream in place of yogurt! It was easy peasy lemon squeezy! LOL! I doubled the recipe too – No issues! I did not have enough lemons, so I used 1 lemon, 1 lime and 1 tangerine… I zested all 3 for a combo effect and combinined the juices! It was amazing! We loved, loved, loved it! It was gorgeous too with all the different colored zest in the icing! Doing a girls potluck next weekend, it is going to be there too! My new go to dessert! So quick and easy and sooooo tasty! Thank you for the best recipe ever and it was GF and Dairy free too! WOW! The zest combo sounds great and gluten-free cooks will be happy to know this. Thanks for sharing. Very very good recipe. Snowed in and only had coconut yogurt, so I made it a lemon coconut brownie. I then added shredded coconut on top of the cake after it came out of the oven, and added the glaze on top of the coconut. Wow, Jenny! Can you use Stevia or Swerve instead of the sugar for the same recipe? I am diabetic. I just made this and it was reaaaaally good! Although I failed to top it with the white glaze (I followed your glaze recipe carefully but mine turned out to be very transparent and made the top of the cake too sweet), I love the recipe, so thank you very much!! I keep making these, and everyone keeps gobbling them up. I also tried a lime version, and YUM! The lime flavor is too subtle if you use only the zest and juice, so you need to add some pulp to both cake and glaze. I also added a touch of green food coloring to the cake; the zest was enough to colour the icing. It is soooooo good! Tried it with pineapple as well, but that came out too mushy. Next I’m trying it with orange. Love this recipe! I leave mine to sit in the foil, on a cooling rack, for about a half hour after I take it out of the oven. Then I gently peel the foil away, and it works well every time. It might be your brand of foil so you can always grease the foil if it helps. If you let me know what ingredients you used and any substitutions/changes you made, even pan size & type of oven, etc. I can probably tell you why they didn’t work. It’s important to me that my recipes work for everyone and these are worth trying again. I just made them yesterday. Have made these several times now – they are delicious! Hi. I was on holiday in a rented house, and had no butter, so googled up this recipe. I also had no square tin, so used a round one, and no yogurt, so used sour cream instead, and no icing sugar, so I didn’t do the glaze, and no measuring spoons, so I used regular spoons and guessed fractions of them, and only rice bran oil. I ended up with a perfectly reasonable lemon cake, nothing like as stodgy as I expected from a brownie recipe. Go figure. I might try again, adding maybe a half cup of coconut next time. Can you use probiotic bulgarian yogurt? I’m just not sure. I have never baked with it and I can’t find any recipes that use it. Baking in glass usually requires that you reduce the oven temperature by 25 degrees but you would not likely get a good result with an 8 x 11 pan. You could use an 8 or 9-inch round pan, or even a 9 x 9 square could work. I like this so much! Can you also do a healthier version of the lemon bars? Can I substitute the yogurt with whipping cream instead? Whipping cream won’t work because this recipe depends on the acid in the yogurt to make the brownies rise. Surely the lemon juice provides enough acid to do this? Two tablespoons of lemon juice might be enough acid but I find yogurt also adds moisture to baked goods. I should have added that whipping cream being a liquid would not work in this recipe. If whipped, I really don’t know but it has a lot of fat so it would not be as healthy as yogurt. First time on your page. Fallen in love at first sight. This is delicious! Thanks for sharing your recipe. I slightly adapted by adding 1/4 cup desiccated coconut to the mixture, and a little less flour, and also sprinkling some coconut on top at the end. Yum! Had no butter at home and came across this recipe; absolutely delicious! Also had no lemons and used oranges instead, can’t wait to try it with lemons now. Many thanks indeed. This is amazing!! although the texture is more like cake than brownies, it’s gotten a “must make again” in my kitchen……..
just made these and they taste good! can greek yogurt be used? Yes, Greek yogurt is good in this recipe as long as it’s not fat free. I tried your easiest lemon brownie recipe tonight for the first time. I used the whole wheat pastry flour instead of all purpose flour and I followed the recipe exactly. After 20 minutes in the oven, I checked them and the toothpick came out clean. I let them cool for about 10 minutes and when I went to pick it up off the foil, the middle was mushy and not done! Any ideas on why the middle would not be cooked done but the sides were?? I am an experienced baker and I’ve rarely had baking mishaps. Any advice would be appreciated! 1) Did you use an 8-inch square pan? 2) Did you use a light colored pan? 3) Did you use a glass dish? 4) Is your oven temperature accurate? 5) Was the oven rack in the center? 6) Did your oven preheat long enough? 7) Did you use fat free yogurt? I can’t think of any other reason – please let me know if anything above could be the problem. I was wondering what you could substitute the powdered sugar for if you don’t have any. They say you can put one cup of regular sugar and one tablespoon of cornstarch in a blender and process it until it’s powdery but I have never done that so I can’t speak from experience. The trick with the corn starch worked!!!! It’s hard to find Fage yogurt here. Are there any other yogurt that can be used like yoplait? paul’s natural yogurt? Apart from the sour cream substitute. You can use any brand of yogurt. Fage happens to have a nice thick texture considering it’s low fat. I never use fat-free yogurt because of its odd texture and added stabilizers. I use 2% in this recipe just to keep it low fat but you can also use regular full fat yogurt. Delicious ! Question: how should I store these for the next day to keep them moist and keep all the goodness in over the night?? I keep mine in a covered container on the counter for a day or two and after that, in the same covered container in the refrigerator. My grill oven’s maximum temperature is just 250 degree, not 350 like yours. So please how do you suggest me to do? Longer time? Much appreciate your answer Jenny! Possibly your oven is in degrees Celsius, not Fahrenheit? In which case, use 180°C. I intend to make this recipe tomorrow because it looks so good and have so many good comments I’m sure it’s a great recipe. Just one thing I need to ask you, how long do you need to preheat the oven before putting the batter inside? Does it really matter to the result? Thanks alot Jenny! The average time is 15 minutes to preheat the oven to 350 but I usually preheat mine for 20 minutes. It does make a difference if you put something in to bake before the oven is hot enough. Baked goods need that initial blast of heat to bake properly. An oven thermometer is the only way to know for sure when it reaches 350. Newer ovens preheat faster than older ones so if you’re not sure, you could preheat for 20 minutes for peace of mind. I just made these lemon brownies and they are De-licious!!!!!!!!!!!!!! So refreshing. I ran out of butter and now I need not replace. Thanks for so many sweet and healthy options. Have made the lemon brownie and my family n friends loved it! Thanks for sharing! I want to no why it’s called lemon brownies instead of lemon slice? Sorry for asking! I love easy recipes! Can you make without eggs? I don’t see how you could make it without eggs because they are the “glue” that holds the batter together. Yes, you can replace eggs in any recipe using Mayonnaise. 2 tbs per egg. And No you will not know it is there . Vegan may of can be used too. I wonder if a “flax egg” could also be used as a substitute? Hi jenny. I’ve recently tried out your recipe for the lemon brownie and it was terrific, thanks for sharing! i made these on a whim for my mom the day before mothers day and hid it in the fridge. no mixer, no butter — it was so perfect. except we didnt have lemons either so i just crushed almonds and used vanilla extract in place of everything that needed lemons. but it turned out delicious and my mom loved it! Made these yesterday and are quite good. My family like them because they are very moist. Thanks Jenny. Looking forward to trying more of your recipes. I just made these lemony brownies today and they are very delicious:)Thanks for sharing this recipe.They are quick and easy to make and at the same time healthy too! Would love to try more of your recipe and share it with my friends! Love your video, outstanding job!! I am not to crazy about lemons except for lemonade. Came out very moist and taste great !!!! How big is the cup that you measure the ingredients for the lemon brownies, please. I pre-measured my ingredients and put them into coloured bowls. I used standard dry measuring cups and on my scale, one cup of flour weighs 4 1/2 ounces or 130 grams. I hope that helps. I used parchment paper instead of foil. I personally do not want aluminium touching my food. I also use those black binder clips if I need to hold parchment paper in place on baking pan. They can be bought at office supply store. Jenny, Oh My Oh My….One word describes your lemon brownies; Amazing ! I grated 3 lemons for the brownies instead of two. YUMMY ! Thanks for all your wonderfful recipes. It is incredibly easy and AMAZING. One of the most delicious things I’ve made. I used coconut oil instead of canola but it turned out still AMAZING. Thank you so much, Jenny! I just made these yesterday and they are almost gone, I cannot stop eating them. I used parchment paper to line my glass baking dish and it worked great. I cannot have milk products so I used Tofutti sour supreme instead of the yogurt and they came out perfect. Just an FYI for anyone else out there with cow milk allergies. Yo soy Mexicana y tengo muchas limones en mi casa. Con este receta yo puedo utilizar las sobras.. Muchas gracias. Tambien yo prepare hoy LAS SALMON PATTIES..Sabrosa !!! dear jenny, i made this over and over and over again. it is so delish !!!! If you eliminate the yogurt you will probably lose some of the moisture and a little of the fat. I might increase the oil by a tablespoon if you do. Please let me know if they turn out. Will do again, no doubt! Oh my goodness I’m addicted! 2nd time I’ve made them in a week and the first time they didn’t last a day! However I do need to say that both times I have not had plain yogurt and used strawberry yogurt and I have nothing to compare it to but I would say these are amazing, thank you! You could try using reduced fat sour cream instead of yogurt. Made them with sour cream and they turned out just fine. Have you tried not using any baking soda? I have read that using only eggs as the leavening agents makes a more dense brownie. I prefer the real “fudge” like texture rather than the cakey brownie. I will try making some today without the baking soda and will report back. Okay, I made them without the baking soda and the taste was just as good and I would say they were more dense than chewy but they still tasted really good. I posted a picture of your version in today’s blog. These are the MOST AMAZING lemon brownies EVER!! And so easy!!!! Thank you, Jenny!! Hi Jenny, I tried the recipe with limes to experiment a﻿ little. I was pleased with the flavor. One difference is that instead of powdered sugar for the glaze, I used agave nectar. It was too wet, for a glaze, but tasted great, so I used just a little. Thank you very much for this recipe. My husband enjoyed it too. The Lemon Brownies really taste good! I look forward to trying this recipe. Can’t help but wonder if it would be just as delicious made with oranges or limes. What adjustments would be needed? I’ve haven’t tried it (yet) but I think if I﻿ were using oranges, I would reduce the sugar by 2-3 tablespoons. With limes, I don’t think I’d change anything else but if you try either variation, please let us know how they turned out. is it ok if i﻿ dont use oil? I’ve never done it but you could try doubling the yogurt and not using oil. If you don’t like the result, you could try the extra light olive﻿ oil. I’ve used that and there is no detectable olive taste at all and olive oil is proven to be heart-healthy. If your no-oil version works out, please share it with my readers here. Thanks. Wow! I never thought to eliminate the oil but I’m sure some of my readers will want to try your version. I will definitely try it, too. Thank you for sharing this with us. Hello Jenny! I love this recipe and i would just like to ask you if the yogurt is replacable with more oil? Maybe use 1/4 of a cup of oil instead, just like in your chocolate brownies recipe? Thank you very much and greetings from Argentina!! I don’t think it would work. It’s better if you can follow the recipe. Jenny, I have made these twice now and I don’t know why my icing (glaze) doesn’t turn out light and fluffy like yours. It is more like a glaze. Am I doing something wrong? I follow your recipes verbatim. It seems to liquefied. I made them today and again the icing doesn’t look like yours. Confused?? Sue, I’m glad to wrote because I checked the recipe and it should have read 2-4 Tbsp. lemon juice for the glaze (it has been changed). Please note it’s not a frosting but a glaze and I think the shiny top in my photo makes it look thicker but it’s not thick at all. If you want a thicker glaze, just use the least amount of juice possible, adding it very slowly, 1/2 teaspoon at a time. But here’s some good news: I’m making a video of this recipe because it’s just so good I want everyone to see how easy it is. The video will be up in the next couple of weeks.